I've been a user of GIS since the late 1990s and in that time have mostly used ESRI software, such as ArcView 3.2 and ArcGIS versions 8 to 10. The first piece of GIS software I ever used was MapInfo 5 and I continue to use it now and again (in version 9.5 or above) - mostly for manipulating large datasets with hundreds of thousands or millions of records. I still really like both of these for different reasons so this post is definitely not a proprietary-GIS-bashing piece. It's just an encouragement to current GIS users to take a serious look at QGIS if you haven't already. I've been using it on and off for a couple of years and in that time have seen serious improvements. Most recently, I've done a good bit of mapping with it - as in the example below (commuter flows in Scotland, in case you're asking). There are many reasons to start using QGIS. The most obvious one might be that it is a cross-platform free and open source GIS that can do many things as good as or better than paid-for software. Take a look at the QGIS Flickr map showcase for some more examples. Of course, it is possible to make stunning maps with other open source packages such as R, but there is a really steep learning curve and many people don't have the time or inclination to get into it. 1. The high quality map rendering and symbology options available to you - for example, QGIS handles layer and feature transparency in such a way that you can produce really attractive maps. QGIS includes by default so many nice looking, sensible colour schemes that it's much easier to produce quality maps. 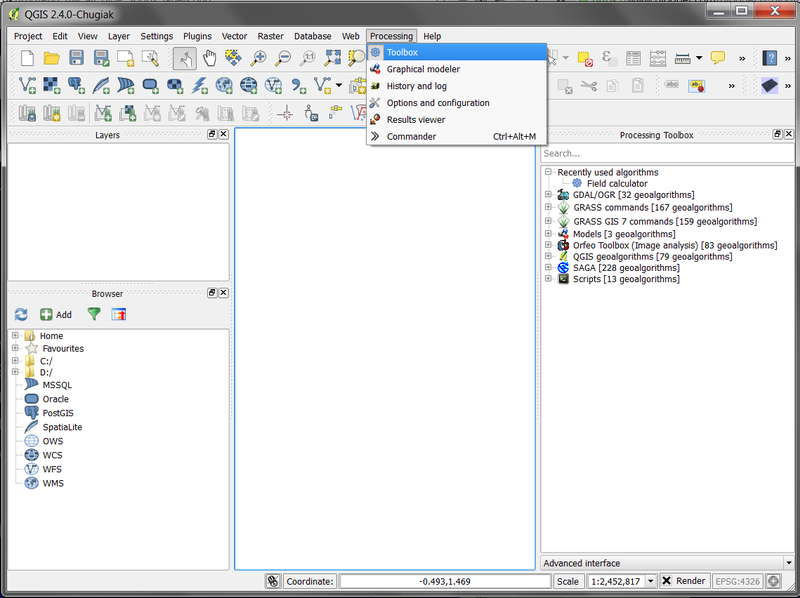 Anita Graser (QGIS author and guru) highlighted the way QGIS integrated ColorBrewer at version 1.4, for example. With version 2.4, you can also automatically invert colour schemes - which was one of the rare things that frustrated me in previous versions. 2. The Processing Toolbox, with which you can access a huge range of spatial analysis and data management tools to perform a massive variety of tasks. See screenshot below for how it looks. If you want to add x,y coordinates to a polygon layer, this can be done really simply here, in addition to so many other geocomputation tasks (e.g. calculating area, line lengths and so on). Beyond the basics there are also so many other more complex tasks you can perform here. 3. QGIS Plugins - which really are fantastic. The one I probably use the most is OpenLayers, which allows you to add a large number of different base layers to your QGIS map - from Google streets and Bing Roads to OpenStreetMap and Stamen Toner layers. As I write, there are currently 214 available plugins listed in QGIS 2.4. Another fantastically useful plugin is Table Manager, which allows you to very quickly change field headers in attribute tables. 4. Flow mapping in QGIS. This is something I've done a lot of over the years but recently I've been blown away by the simplicity and elegance of the way QGIS can convert massive CSV files into large flow maps. MapInfo had served me very well in the past - and is still amazing when you use a single line of MapBasic - and recently ArcGIS has improved, but it still has a way to go. All you need to do in QGIS is format a CSV file and have one Geom field with the LINESTRING command and x, y coordinate pairs formatted as in the image below. Once you import this file using the Add Delimited Text Layer tool the job is done. The results - following a bit of styling - can be amazing. What I love even more about this is that I picked up this tip from a StackExchange post by a 73 year old retiree! Isn't the internet amazing? As I've been writing this I've mentally added several more things to the list but I'll stick with the above for my favourite four right now. I do, however, also love the labelling options, the coordinate system selector options, the vector tools and the fact the user community is so helpful. I still find the Print Composer a bit fiddly for creating maps in but this is a relatively minor issue. I expect I'll always take a portfolio approach to working with GIS software and continue to use QGIS alongside ArcGIS and MapInfo, but I'd be a bit lost without QGIS now. I'm probably quite behind the curve with all this and I should have got more into QGIS a long time ago but it's still relatively early days in the mass take-up of the software, though some UK councils are now big users. So, why should you start using QGIS? Because it's absolutely fantastic, really powerful and pretty straightforward to learn if you already know your way around another GIS. Oh, and it's free - though it costs money to develop so you can always donate here.